Young people aged between 18 and 24 are European citizens who have the potential to become leaders of the next generation. This project takes place in a context where the European Union is experiencing a deep crisis of credible leadership and more, young voices are less listened to and integrated in decision-making and the development of major action lines. The key competences that young people have to acquire through education also include communication skills inherently linked to leadership skills: a good leader needs to communicate effectively his message. The partnership is heterogeneous, with organizations from countries with different cultures and different leadership approaches: Romania, Italy, Croatia, Bulgaria on the one hand and Sweden, Norway and Denmark on the other. The consortium organizations have launched a debate among members, volunteers and beneficiaries of partner organizations' activities. The internal debate was finalized at conferences (each consortium organized a conference) to draw conclusions on the issues underpinning a little leadership among young people but also on the needs of young people and which must be met in order to form tomorrow's EU leaders. - The need to develop communication skills and all the related skills: argumentation, synthesis, etc. 1. Development of 4 key competences specific to European leadership and 3 related skills over 9 days in a mobility that takes place in Timişoara and involves 42 young people. 3. 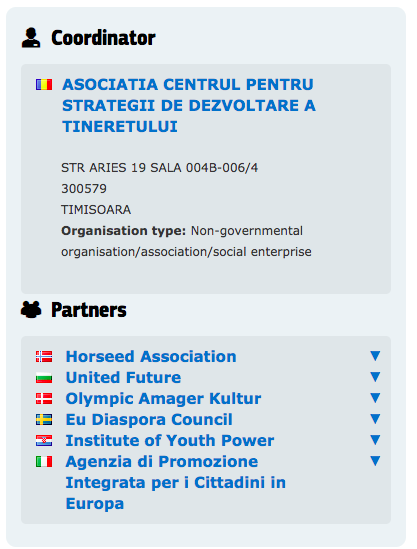 Strengthening and encouraging the use of European values and EU preservation through multicultural, simulation and understanding activities of the EU institutions and the EU as a whole over the course of 9 days in a mobility that takes place in Timisoara, where 42 young people.